SUMMARY: From the author of Virtuosity, a novel about two sisters and the secrets they tell, the secrets they keep—and the secret that could tear them apart. Amelia’s not sure she can forgive Charly this time, and not sure she wants to... but forgiveness is beside the point. Because Charly is also hiding a terrible secret, and the truth just might tear them apart forever. There is a quiet pain to this one, mixed in with a breathtaking poignancy that will have readers gripped and engaged from the start. Playing heavily on the relationship between the two sisters, yet also keeping a strong focus on Amelia and how she handles everything, Martinez’s talents shine in this book. While the big secret can be predicted, it isn't really something that readers are supposed to have no idea about, and suspecting it in no way detracts from the rampant feelings through this book. If anything, it amps them up, leaving readers to study the characters even more intensely, yet also having a gutting feeling as things are revealed. Amelia is a fantastic big sister, having no particular ill will towards her sprightly and intriguing younger sister despite seeming to clean up her messes more often than not. Clearly someone who loves her sister and wants to protect her, yet also not going so far as to keep her under lock and key, there is a certain selflessness to Amelia at the start. As things start to happen, though, her ability to remain so considerate is challenged, and there are some times where she is decidedly selfish. Despite the ways her flaws really start to show, and the times she says some truly awful things, readers will understand why she reacts as she does, and will feel her pain tenfold. As I read this one, I never really felt myself be particularly angry with Amelia, even when she was at her worst, primarily because Martinez does such a stunning job of infusing Amelia’s feelings and motivations into every page. My frustration stayed with Charly more often than not, suspecting but not always completely understanding why she was doing the things she did, reacting as she did. Still, I love both these sisters, and wanted both of them to find a way through all of this and come out on top, without completely kicking the other down. Martinez absolutely nailed the push and pull between these girls, without blatantly forgiving their flaws and mistakes yet also not eviscerating them for it. The setting in this one is vivid and well portrayed, and there is actually quite a bit of gentle humor mixed into what is, overall, an arresting read. Add in the soft romance that takes place with a boy who is awkward and charming, yet holds plenty of secrets of his own, and there is plenty to keep readers hooked. 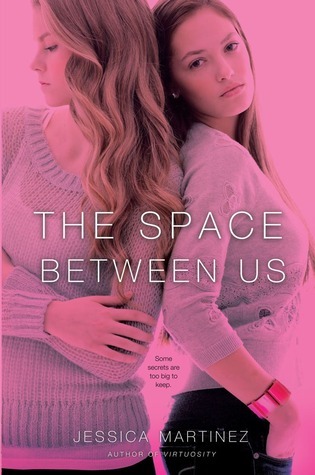 Well written, with a smooth flow and intelligent writing, infused into a voice that is very clearly Amelia, rivaled against the vividness that we get when Charly flutters across the pages even from the start, The Space Between Us is one for the favorites shelf.